Reading and share top 6 famous quotes and sayings about Tennis And Life by famous authors and people. Browse top 6 famous quotes and sayings about Tennis And Life by most favorite authors. 2. "The freedom of an unscheduled afternoon brought confusion rather than joy. Julius had always been focused. 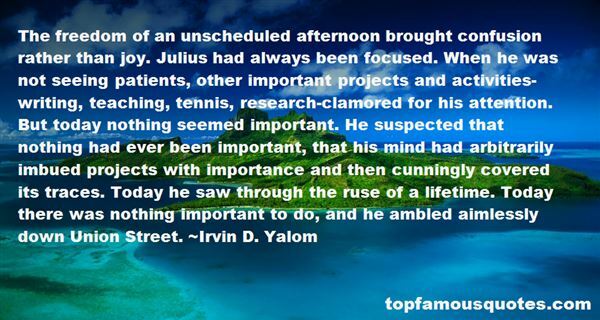 When he was not seeing patients, other important projects and activities-writing, teaching, tennis, research-clamored for his attention. But today nothing seemed important. He suspected that nothing had ever been important, that his mind had arbitrarily imbued projects with importance and then cunningly covered its traces. Today he saw through the ruse of a lifetime. Today there was nothing important to do, and he ambled aimlessly down Union Street." 3. "No, like I said, my dad was never really part of the tennis. His involvement around what I did with the tennis and with my mom and my grandparents was really not a part of my life." 4. "The Sometime Sportsman Greets the Springby John UpdikeWhen winter's glaze is lifted from the greens,And cups are freshly cut, and birdies sing,Triumphantly the stifled golfer preensIn cleats and slacks once more, and checks his swing.This year, he vows, his head will steady be,His weight-shift smooth, his grip and stance ideal;And so they are, until upon the teeBefall the old contortions of the real.So, too, the tennis-player, torpid fromHibernal months of television sports,Perfects his serve and feels his knees becomeSheer muscle in their unaccustomed shorts.Right arm relaxed, the left controls the toss,Which shall be high, so that the racket faceShall at a certain angle sweep acrossThe floated sphere with gutty strings—an ace!The mind's eye sees it all until uponThe courts of life the faulty way we playedIn other summers rolls back with the sun.Hope springs eternally, but spring hopes fade." 5. "Speech, tennis, music, skiing, manners, love- you try them waking and perhaps balk at the jump, and then you're over. You've caught the rhythm of them once and for all, in your sleep at night. The city, of course, can wreck it. So much insomnia. So many rhythms collide. The salesgirl, the landlord, the guests, the bystanders, sixteen varieties of social circumstance in a day. Everyone has the power to call your whole life into question here. Too many people have access to your state of mind. Some people are indifferent to dislike, even relish it. Hardly anyone I know." 6. "Tennis is all about mental toughness, and you have to keep your head in the game. I make time to relax away from competition pressures, travel and intense training schedules to make sure I'm looking after myself. Taking time out with family and friends helps to maintain the work-life balance everyone needs." Écoutant, en effet, les cris d'allégresse qui montaient de la ville, Rieux se souvenait que cette allégresse était toujours menacée. Car il savait ce que cette foule en joie ignorait, et qu'on peut lire dans les livres, que le bacille de la peste ne meurt ni ne disparaît jamais, qu'il peut rester pendant des dizaines d'années endormi dans les meubles et le linge, qu'il attend patiemment dans les chambres, les caves, les malles, les mouchoirs et les paperasses, et que, peut-être, le jour viendrait, où, pour le malheur et l'enseignement des hommes, la peste réveillerait ses rats et les enverrait mourir dans une cité heureuse."